This morning I had a chance to speak with a representative from Corsa Performance Exhaust about their new exhaust package for the 2013 Ford Shelby GT500 Mustang – a setup which adds 35 horsepower and 47lb-ft of torque to the 200+ mile per hour super muscle car. If you are somehow unfamiliar with the 2013 Ford Shelby GT500 Mustang – it is the latest collaboration between the people at Ford’s SVT high performance division and the minds at Shelby American – with this incredible American muscle car churning out 662 horsepower and 631lb-ft of torque. This makes the 2013 GT500 the most powerful production Mustang of all time but it also makes it the fastest with a top speed of over 200 miles per hour. However, in the muscle car segment you can never have enough power and that is where the folks at Corsa Performance Exhaust come into play with their new exhaust setup for the 2013 GT500. Prior to installing their new exhaust system for the 2013 GT500 Mustang, Corsa strapped the modern Shelby Cobra onto a dyno for some baseline runs and the results were impressive with peak stock figures of 595.53 horsepower and 564.34lb-ft of torque at the rear wheels. That represents a very impressive drivetrain loss figure of just 10% between the back of the crankshaft and the sticky rubber that puts that power to the ground. Next, Corsa installed their axle-back exhaust system for the 2013 Ford Shelby GT500 Mustang which basically replaces the stock mufflers with units that offer more sound along with improved exhaust flow and while the horsepower didn’t change, just adding these mufflers raised the torque output to 583.07 - an increase of 18.73lb-ft over the stock setup. Using that 10% drivetrain loss from the baseline dyno run, the Corsa axle-back exhaust system for the new GT500 increases the full torque output up to roughly 648lb-ft of torque at the crankshaft. Finally, Corsa added their high flow XO-Style Crossover Pipe along with the axle-back setup and headed back to the dyno with incredible results. 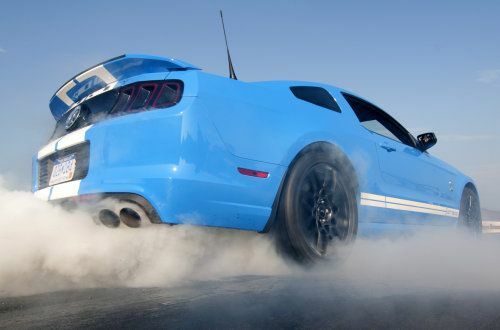 Simply by changing the exhaust system, the 2013 Ford Shelby GT500 Mustang put down a whopping 612.44 horsepower and 607.31lb-ft of torque at the rear wheels. This accounts for an improvement of 17 horsepower and 43lb-ft of torque in terms of peak engine horsepower and torque. When once again using that 10% drivetrain loss figure, the 2013 GT500 is packing a total peak output of roughly 681 horsepower and 675lb-ft of torque. More importantly, Corsa found that through the midrange, the 2013 GT500 picked up 35 horsepower (at 3,900rpm) and 47lb-ft of torque (at 4,000rpm). It should be noted that the peak torque output of 607.31lb-ft was right in that midrange sweet spot while the peak horsepower came at the higher end of the powerband…roughly around 6,200rpm. "We designed this new exhaust to unleash the power of the 2013 Mustang GT500," said Craig R. Kohrs, VP and General Manager, TMG Performance Products (parent company of Corsa). "The combined Axle-Back system and XO-Style Crossover Pipe improve airflow to deliver impressive performance gains of 35 HP and 47 lb.-ft. of torque." It has long been an arguing point in the aftermarket world whether or not simple modifications like an axle back setup really adds any noticeable power but thanks to the dyno tests provided by Corsa – even on a vehicle with a stock exhaust system that is set up for high flow like the 2013 Ford Shelby GT500 Mustang – changing to the right exhaust system can amount to some big power gains. Corsa was kind enough to also provide a video clip of the 2013 Ford Shelby GT500 Mustang in action with their power adding exhaust system and you can check that out in the embedded video below! Note: The 2013 Ford GT500 shown doing a big, smokey burnout above on the right is not equipped with the Corsa exhaust system - hence the different color stripes from the GT500 in the video above. It is just an awesome picture of the new Shelby offered by Ford Motor Company.